Gogo s launching a new plane Wi-Fi technology that will be about seven times faster than current in-flight Wi-Fi speeds. Wi-Fi on planes is about as reviled as cramped coach seats and checked-baggage policies. But in-flight Internet connections will soon be much more tolerable. Gogo, the company powering Wi-Fi connections on two-thirds of North American airplanes, announced Thursday that it is launching a new Wi-Fi technology that will be about seven times faster than current in-flight Wi-Fi speeds. The new technology, which Gogo has dubbed "2Ku," uses satellites and complex onboard antennas to deliver a much better experience for flyers. Airplanes will receive a 70 megabit-per-second connection, which is about four times faster than your average home broadband connection. That has to be distributed among everyone on the plane, but Gogo says when 40 devices are connected simultaneously, flyers have been averaging speeds of about 12 Mbps -- about what your smartphone gets from its 4G connection. That means you'll be able to stream movies, in addition to accessing emails and browsing the Web. "I am 100% sure that everyone will be able to browse on a plane," said Gogo CEO Michael Small. "I think it'll be fine for streamers too." Current planes are using outdated 3G connections that deliver about 9.8 Mbps to a plane, which is likely slower than what you're experiencing on your home Wi-Fi network. Split that among a hundred passengers, and you're in dial-up territory. The problem was that Gogo owns an incredibly small swath of wireless spectrum -- just 3 MHz. By contrast, Verizon has more than 30 MHz of spectrum for its 4G LTE network. Smaller spectrum holdings equate to a narrower pipe to squeeze all that data through. That's why Gogo decided to switch to satellite technology. 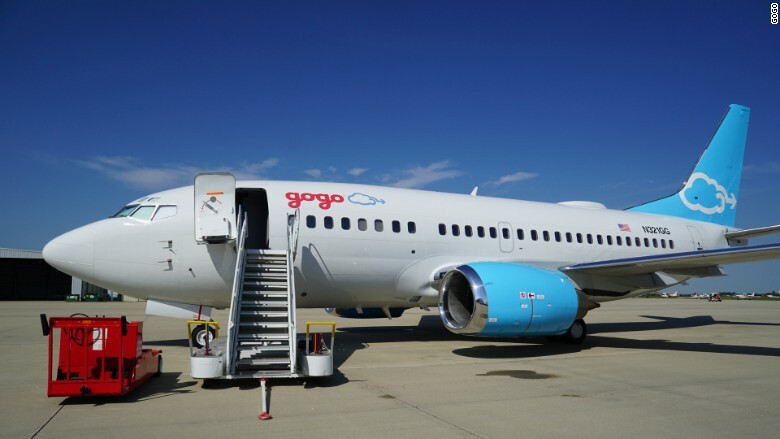 They're expensive to operate and they have some coverage problems, but Gogo believes it solved those issues with an innovative, round antenna design that will enhance the signal's connection. As a bonus, satellites can be used around the world -- a relief to customers traveling on international flights who have become accustomed to Wi-Fi service disruptions while flying over water. Gogo (GOGO) has contracts in place to deploy the new technology on 550 airplanes across eight airlines -- half of which are in the United States. It might be a while before you get to experience the faster 2Ku in-flight Wi-Fi for yourself, though. Gogo said the first couple planes will roll out the technology by the end of this year, with a handful more in 2016. But the bulk of the installations will take place in 2017 and 2018. The slow rollout is due to the extremely difficult task of negotiating global logistics of the airline business, as well as passing rigorous safety and security protocols. "It's so hard to change things in aviation," Small said. "But the airlines all want connectivity so badly, they'll turn a plane inside out to get our stuff on it. By aviation standards, this will roll out very quickly, even if you and I think it's coming at a glacial pace."